If you haven’t tried the Daytona Beach style wings at Hooters, then you’re missing out. These wings are tossed in a sticky, sweet and spicy sauce that is completely addictive. Luckily for you, I have the secret recipe that will show you how to make a boneless version of these wings along with this amazing sauce. Combine the flour, paprika, salt, and pepper in a plastic bag. Put the pieces of chicken in the plastic bag and shake to coat. Place the chicken pieces on a foil lined baking sheet sprayed with olive oil. Bake for 15 minutes or until cooked. While the chicken is in the oven, combine sauce ingredients in a saucepan on the stove. Reduce mixture on medium low heat for at least 15 minutes. When the chicken is finished cooking, toss it in the sauce. Optional: Throw the sauce coated bites in the oven on low broil for 5 minutes to give them a nice glaze with the sauce. Wings: Of course you can use this same recipe for wings too! You will definitely want to thrown them on the grill or in the broiler for a few minutes after being coated in the sauce to give them a good glaze. 2) Allergy Relief In Minutes – Secrets Revealed! Today I have a new secret recipe for one of my favorite appetizers at Hooters. 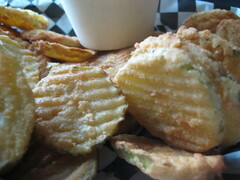 The fried pickles are nice and crunchy with just the right amount of spice. Can also use this batter on zucchini, eggplant and green tomatoes. Proven system forces your body to burn away unwanted body fat. Preheat 8 cups of vegetable oil to 350 degrees F in a large pot. Drain dill pickles in a colander and then place into a medium sized bowl with the 2 cups of buttermilk. Take about a handful of the pickles out of the buttermilk and dredge into the seasoned flour. Shake off excess flour, and place battered pickles into hot grease. Be careful not to place too many pickles into the hot grease or the pickles won’t fry up crisp. Fry pickle slices until golden brown. Continue cooking pickles until all are done. 3) Discover The Secrets of Healthy Chinese Cooking. Mix all ingredients together. This will store well in the refrigerator for up to 2 weeks. Use this sauce to make Hooter’s Hot Wings. I absolutely love spicy foods! My all time favorite is Buffalo wings, but when I came across this recipe for Buffalo shrimp, I knew I had to try it. These had just enough kick and I served mine with a chipotle mayo. I highly recommend this recipe as a good appetizer for your next party.